The localized surface plasmon resonance (LSPR) extinction spectrum and its dependence with permittivity of the surrounding medium have been broadly explored for molecular sensing applications. The sensing performance is governed by the bulk sensitivity and the linewidth of the LSPR peak. Therefore, a sensor needs to attend both requisites: a high bulk sensitivity and a sharp LSPR spectrum, related by the ηb ×FoM parameter. 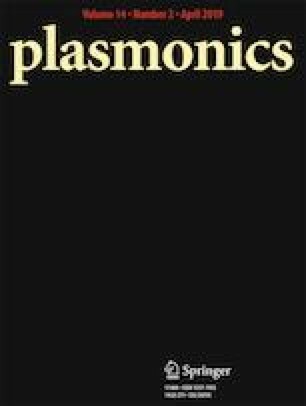 Complex plasmonic structures are proposed for sensing applications due to their high sensitivity values without considering the broad nature of the LSPR peak, that decrease the detection limit of the plasmonic sensor. In this article, we report the optical properties of SiO2 core/Au nanoshell (Au-NS) particles and the feasibility of exploring it as a sensor platform. On tuning the geometric parameters of the Au-NS, we have obtained the optimized the ηb ×FoM parameter with a value of 2057.4 nm/RIU2, which is the highest reported in the literature with spherical shapes. Moreover, for molecular adsorption sensing, Campbell’s model was exploited on a size-dependence approach. Finally, we have studied the influence of a dielectric substrate on the Au-NS sensing performance. Our results provide new bases for the development of high-performance nanostructures for bulk and molecular LSPR sensing. The authors are grateful to Conselho Nacional de Desenvolvimento Científico e Tecnológico (CNPq), the National Institute of Science and Technology of Photonics (INCT de Fotônica), and the Coordenação de Aperfeiçoamento de Pessoal de Nível Superior (CAPES) for financial supports.